The Official Tribe of Hawaii is a place for you to gather and share your knowledge, tips, trips and events all having to do with a place you love. Join a community of avid travelers and experts who share your passion for Hawaii, and become a part of the conversation. Outrigger seems to always have good options for that type of traveler in Hawaii. I am booking a group of hikers to go to Maui. Does anyone know a good Maui property (Condos would work best) that's good for groups? Have you tried Travel Pro Rentals? I am heading to Maui for a business incentive trip and want to extend for 3 nights prior to the work event and have been trying to decide on whether to stay in Wailea at either the Marriott or Four Seasons there or go to kauai and stay at the marriott there? Thoughts? We loved Kauai....that would be my pick and that hotel faces the ocean....gorgeous! I would go to Kauai. you are traveling a long way, see as much as you can! I think Kauai is a totally different experience than Maui. I have stayed at the Marriott, but you may also want to check out the Hyatt. Please let me know if you need any help booking ay thing! any suggestion for a 5 to 7 days vacation on budget? where should i stay, which islands to go and when is the best time to go? Hi Kenneth - Depends on what's the most important to you. Do you want to stay oceanfront, would a condo across from the beach be OK? Are you looking for nightlife, fabulous beaches? If you can let me (us) know what your highlights should be, we could certainly narrow it down for you. All the islands are beautiful but each one is unique. Have they considered a cruise? That is an awesome way to see Honolulu, Maui, Kauai, Kona and Hilo. You basically cruise by night and are in port every day. Excursions on oard the ship are reasonable too. I don't know what their budget is, but we went 2 years ago for around $5K. That was our flight, 2 nights motel prior to cruise and 1 following and the cruise. The family includes mom, dad, girl and boy (both under 10). This would be their 1st visit. Mom and dad want a private area for alone time. Any suggestions? Would a resort, hotel, or condo be best option for them? I would recommend a resort for this family because they are very budget friendly when it comes to families and they would offer amenities that would accommodate the children while mom and dad are sharing some alone time. For economy sake, have you considered the Embassy Suites Waikiki Beach Walk™ hotel. The only all-suite nationally-branded resort in all of Hawaii, this peaceful resort is set right in the heart of the Waikiki Beach Walk™ area. Located in a family-oriented and vibrant area, guests can enjoy a wide range of boutiques, entertainment and dining options. Or you can find peace on the golden sands of Hawaii's world-famous Waikiki Beach, located only a few steps (actually 2 blocks) away from the hotel. Personally, my family and I love to relax at the open-air fourth-floor Grand Lanai, a beautifully indulgent complex which incorporates sundeck, pavilion seating area and pool. The adults enjoy drinks by the poolside bar and I soothe tired muscles with a session in the whirlpool spa after a long flight from the east coast. The nightly Manager's Reception*, serving complimentary drinks and canapés as well as live entertainment is always a hit as well as the daily breakfast (makes the resort fees seem lower! LOL) We start the day well with the delicious cooked-to-order breakfast, serving up an array of omelettes, pancakes, hot and healthy options, then head out on the Waikiki Trolley and find things to do. For this particular client I would recommend a two-bedroom suite so they feel at home in a spacious, modern guest accommodation. They can choose from a one or two-bedroom suite, each providing a separate lounge area to relax in, with comforting kitchen facilities to recreate the sense of home. They could prepare a snack for the day with the refrigerator and microwave, and the kids can curl up in front of the flat-panel TV. Usually I get my loving wife to brew a pot of coffee and enjoy the view from the privacy of your own laniais balcony while the kids get dressed and she does Her hair for the day. Personally I wake early, and enjoy an invigorating workout at the complimentary 24-hour fitness center and stay up-to-date with work at the round-the-clock, fully equipped BusinessLink™ Business Center - Send e-mails or browse with high-speed internet access, so I can send client messages. Wifi is available in all areas of the hotel, and with the set up I have I can make long distance phone calls to the U.S. or Canada. Stay informed with a newspaper, delivered to our suite daily. Characteristically warm, Embassy Suites Waikiki Beach Walk offers trademark Hawaiian hospitality. Committed to the beauty and stories of the island—each day, guests will find their room decorated with a card explaining a little about the people of Hawaii, their legacy and culture. Savor the beauty of this island in the all-suite surroundings of Embassy Suites Waikiki Beach Walk, bringing the best of Hawaii to you. Highlights •Only all-suite resort in Waikiki (O'ahu) Guest Service - friendly staff •Extra Space - 1 and 2 bedroom suites • Located at the heart of Waikiki Beach Walk and steps to Waikiki Beach •Complimentary internet •Complimentary breakfast and Manager's Reception •24-hour Fitness Center & 24-hour Business Center What to do around the resort and nearby? Set on its own chunk of 1.3 acres of prime land in the heart of Waikiki, this hotel is mere steps from the world famous Waikiki Beach. Take a walk to the Waikiki Beach Walk Entertainment Center between Beachwalk and Lewers Street to explore the exciting new retail, dining, and entertainment venues in the area. Explore more of the beautiful area of Waikiki and the tranquil Island of O'ahu. Corporate guests can walk the short distance to Hawaii Convention Center or International Marketplace, stopping to drop into the outlets of the Royal Hawaiian Shopping Center. Spend the afternoon meeting the animals of Honolulu Zoo, or marvel at the underwater world of Waikiki Aquarium. Take the 4 mile trip to Downtown Honolulu and discover the wares of Aloha Tower Marketplace. The hotel is just under nine miles away from Pearl Harbor about an hour from Disney's Aulani and the North Shore is a trek as well, I usually recommend the Polynesian Cultural Center for part of the visit as well. I've always wanted to go to Hawaii and may decide to choose it as our honeymoon destination. I've heard conflicting opinions about the best parts to visit, which islands, hotels and activities. Any suggestions? When are you getting married? Each of the islands has its own charm. 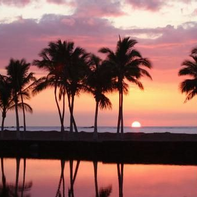 What you are looking for in your trip to Hawaii. Nightlife? HONOLULU, A spiritual connection to the island? Relaxation? Culture, Diving/Snorkeling, Hiking, Resort style living or Hawaiian style? Do you need choices in activities or do you like spur of the moment? What about your budget? Let me know and I can steer you to some suggestions in islands and their charms. We do not have a date set yet but am thinking around September of 2012. We'd like to be close to great beaches, but also an array of natural wonders and cultural attractions. Is it possible to feel secluded but also not be too far from shopping and nightlife? If so, where? Thanks. Is there a better time of year to go over others? Have to Love my Many Allan Hoffman and his many ideas for making the most of a vacation. I also have to call out the many other agents who are adding to the Expert Advice here on TravelTribe.com! Hello Rachel. Congratulations on the upcoming nuptials. I can only say that Allan Hoffman has covered everything very well in Hawaii. The island of Oahu is the "Capital" island and is the most industrialized. If you would like to catch up on the rich history of the US Navy, that would be the island. The Arizona Memorial is one of the best historical information spots, and is only a short visit. Then you could travel the island and see a lot of rich history. Maui is the "Garden" isle, and has much rich flora. All of the islands are very good places to spend a honeymoon. If you would like to remain in one place and get as much of the local island fare as you can, the Aulani Resort on Oahu would be a fabulous place. It has a lot to do and offer. Plus special arrangements can be made for the wedding ceremony, if you would like to have it there! Also on the North Shore of the island is the Polynesian Cultural Center which can give you food from the rich culture that makes up the Hawaiian Islands, along with a quick history of all of the islands. It takes a day to tour and see shows and dances. Then they have food from all over the islands right there in the PCC. It would still allos you to get back to Aulani and enjoy the beaches, or snorkeling, or evern seeing the dolphins and/or whales that may be possibly mating off of the islands western shore. It is something to think about. They have reasonable prices too! Aloha Rachel, Being native Hawaiian, born and raised in Hawai'i, here are some recommendations according to what you said you would like to experience. For shopping and night life, Oahu would be your best bet. Waikiki is still one of my favorite places to stay and take in the night life. You can take a trolley from Waikiki to the Ala Moana Shopping Mall. If your looking for Aloha ware, try Sears, this is one of the spots the locals get Aloha ware from. Their is traditional Hawaiian music by long time well known local entertainers once a week for the cost of a beverage in Waikiki(They are personal friends). The Disney Aulani Resort and Spa in Kapolei is secluded and has a ton of cultural experiences. There are still secluded uncrowded beaches on Oahu, and the major Islands, most visitors don't know about. Cultural experience? If you want the ambiance of a traditional Hawaiian Luau, the Aha Aina Royal Hawaiian Luau in Waikiki is my recommendation. Most of what's sold as a cultural experience in Hawai'i is actually Polynesian, not traditional Hawaiian. As for natural wonders? Well, being on your Honeymoon and its your first visit to Hawai'i, the Norwegian Pride of America 7-Day Hawaiian Island Cruise would be my suggestion. Why? Each of the four major islands has its own natural wonders for you to experience. I just got back from the cruise, and it was absolutely amazing. One of the natural wonders you'll see on the cruise, is the Napali coast on the Island of Kaua'i. This piece of heaven is only accessible by air, hike or sea. It was the first time I ever saw it and is a must see for every visitor. I posted photos on my profile and on my Facebook page(Aloha Travel Experts, LLC), along with videos and reviews of our recent Hawai'i visit. I also posted photos of the Aulani Resort you can view. Best time to visit? Typically Parts of September, October, November and February seem to be less crowded with better pricing. Hope that helps you.